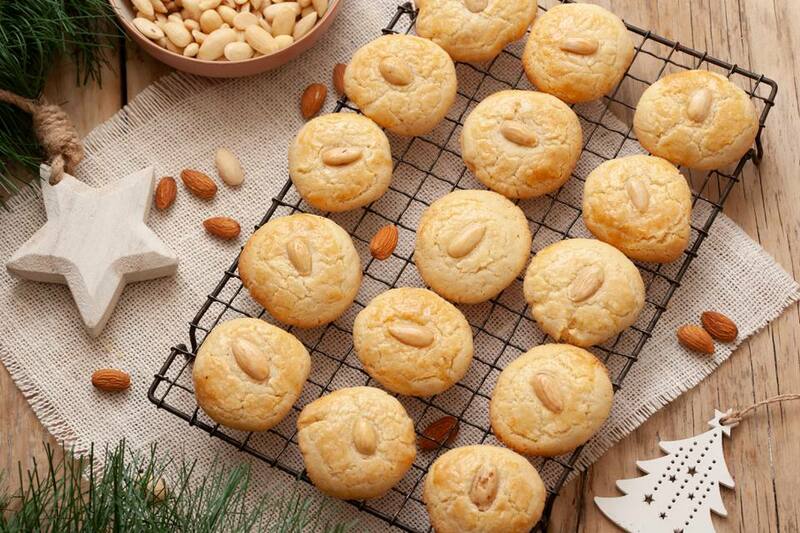 Nutty almond cookies—along with sesame cookies and walnut cookies—are a popular treat at Chinese bakeries, but it's also possible to make these classic Chinese treats at home. Gather the ingredients and preheat oven to 325 F/162.5 C.
In a large bowl, sift the flour, baking powder, baking soda, and salt. In a medium bowl, use an electric mixer to beat together the butter and shortening, and sugar. Add the egg and almond extract and beat until well blended. Add to the flour mixture and mix well. Note: The dough will be crumbly at this point. Use your fingers to form the mixture into a dough, and then form the dough into 2 rolls or logs that are 10 to 12 inches long. Wrap and refrigerate for 2 hours (this will make it easier to shape the dough into circles). Take a log and lightly score the dough at 3/4-inch intervals so that you have 15 pieces and cut the dough. Roll each piece into a ball and place on a lightly-greased cookie tray, approximately 1 1/2-inches apart. Add an almond in the center of each cookie and press down lightly. Repeat with the remaining dough. Brush each cookie lightly with a beaten egg. Bake for 15 minutes to 18 minutes, until golden brown. Cool and enjoy or store in a sealed container.